Come and enjoy the Vue! The Vue off Main offers all the amenities you desire with the best location available in downtown Walla Walla. Close to everything, quiet, private surroundings and luxuriously appointed. 1 Block from Downtown Walla Walla, Across the street from the farmer market, just steps from gourmet restaurants and wineries. 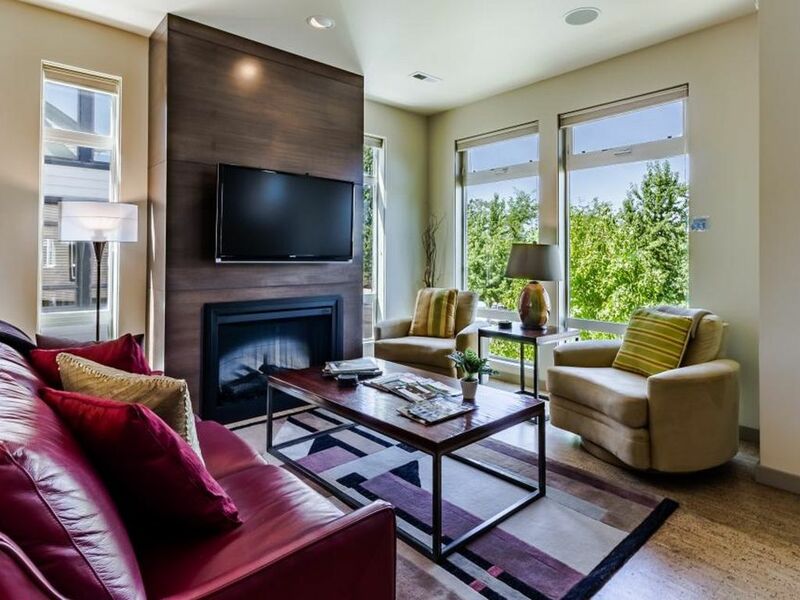 Our modern downtown Walla Walla townhouse has all the comforts of home with the ease and convenience of downtown living. This premier townhome is located across the street from the farmers market and 1 block to the heart of downtown, award wining wineries, gourmet restaurants and the PowerHouse Theater. Enjoy everything Walla Walla and the Wine Country have to offer just minutes from your front door. There are 3 levels of living space for you to enjoy. Designed using environmentally friendly sustainable architecture and interior design from the cork floors to the bamboo cabinetry - every detail is superb. Entry on the first floor, up the stairs to the open living space with modern cooks kitchen, comfy living room, sleek fireplace and balcony. Details designed with you in mind. Cook a meal in the gourmet, well furnished kitchen. The dining table seats 6 with extra seating at the bar. Relax and watch TV on the 47' plasma TV with surround sound. Make your way to the third floor and discover 2 bedrooms with luxurious queen beds, plasma TV's w/DVD player, I-Pod docking stations and 2 private bathrooms with a shared shower. After a long day of exploring the Walla Walla Wine Country, cozy into the soft and comfortable beds for a relaxing nights sleep. Don't miss this beautiful VUE of Walla Walla at the Vue off Main. YOUR perfect urban retreat in downtown Walla Walla. *Private GARRISON CREEK CELLARS tasting and tour, yours free when you purchase a bottle of Garrison Creek wine. Please let us know of your interest in these exclusive offers, and we would be happy to book your tours! If you're coming to wine taste, consider booking 3 nights. Guests comment that with only 2 nights there are so many wineries and so little time!! We gladly accept small dogs and have a firm pet policy. Please email owner specifically regarding your pet for a confirmation. All pets MUST be approved by the owner. We charge a non refundable $100 additional pet cleaning fee. My husband grew up on a wheat farm in the Walla Walla area. We live in the Seattle area with one son. We love coming back to Walla Walla Wine Country and having our own place to stay. We are happy to share our home with you when we're not there enjoying it ourselves! Walla Walla has so much charm, and the people so friendly! LOCATION, LOCATION, LOCATION!!! Downtown Walla Walla Modern, deluxe urban townhome just blocks from some of the best restaurants, wineries and shopping downtown Walla Walla has to offer! 2 private bathrooms that connect (with locking doors ) to a shared tub/shower room. Heated tile flooring. Great street cruisers to get you downtown and around! Located in downtown Walla Walla - wineries, gourmet restaurants and shopping at your front door. Exclusively offered by The Vue off Main: *Private GARRISON CREEK CELLARS tasting and tour, yours free when you purchase a bottle of Garrison Creek wine. *Private complimentary Portfolio Tasting or 50% discount on the Inside Story Tasting at LONGSHADOWS *Complimentary tasting at TERO ESTATES/FLYING TROUT *Complimentary tasting at CADARETTA Please let us know of your interest in these exclusive offers, and we would be happy to book your tours! The Vue was perfect. Everything a girl needs to have a fabulous wine tasting weekend. There were many special touches that made us feel so welcome. The location was amazing. We were able to walk everywhere. We're definitely coming back. We're so glad you stayed with us and enjoyed your wine tasting weekend and all the Vue offered. We look forward to having you back soon! Our stay was fantastic. Look no further than here for the perfect place to enjoy wine tasting in Walla Walla. We walked everywhere! Our accommodations were luxurious, even the linens and towels were fantastic. We will be back. Thank you Kathryn for your wonderful hospitality and sharing your beautiful home with us. Thank you Brenda for staying with us. We're delighted you enjoyed the Vue and all it offers. We look forward to your return visit to the Vue off Main and Walla Walla! Cheers! We've had friends stay at Vue 22 and recommended it. We thoroughly enjoyed this unit. Nice quality, close to everything, it was exactly what we needed. The only thing to nitpick would be the main TV. Having kids, they like to bring a game console, and the TV being an older one didn't have an HDMI port. Highly recommend overall though!! Thank you for staying with us! We're happy you enjoyed your time at the Vue. We appreciate your comment about the HDMI port on the TV - this is the first time anyone has commented on it. Being that we don't have kids using games, it had never entered our minds. When we replace our current TV it will definitely have one and hope you'll come back and stay with us again. We thoroughly enjoyed our stay in this well-appointed condo a few blocks from the center of downtown Walla Walla. The kitchen was well stocked with everything we needed to cook breakfasts. The bed was super comfortable, and the entire place was sparkling clean and beautifully decorated. I had to contact the owner, Kathryn, to change a date, and she was very easy to work with. The garage was a very nice added bonus. It was not a detraction to us, but potential renters should be aware that the bedrooms are on the third floor, which involves hauling luggage up two flights of stairs. We hope to stay here again and I highly recommend it to others. Thank you Julie for staying with us - we're delighted you enjoyed the Vue! I agree that the stairs are more exercise than some people may want, however I'm glad you didn't mind :-) We hope you'll return to Walla Walla and Vue off Main! We have rented HomeAway properties all over the US and in several other countries, and my husband's comment after staying at the Vue off Main was that it was the best equipped we have ever experienced. Kathryn has provided everything for her guests' comfort. We would definitely stay here again and enjoy the homey feel and the convenience of being close to Main Street. Thank you for your return stay and am so happy you enjoy all the Vue has to offer. Even though the weather didn't cooperate, I'm sure you'll agree that wine tastes the same inside whether it's cold or warm outside! We hope to see you again next year. Cheers! Wine Tasting abounds in the Walla Walla Wine Country with over 100 wineries in the area, many just steps from the Vue! Across the street from a fabulous Farmers Market, open May - Oct.
All rentals are charged 10.9% lodging tax. Rates are subject to change. $125.00 cleaning fee charged to all reservations. Please contact us for a rate quote. We gladly accept small dogs and have a firm pet policy. Please email owner specifically regarding your pet for a confirmation. All pets MUST be approved by the owner. We charge a non refundable $100 additional pet cleaning fee.